Dragonfly Cottage is a 4 Plus Star holiday home. 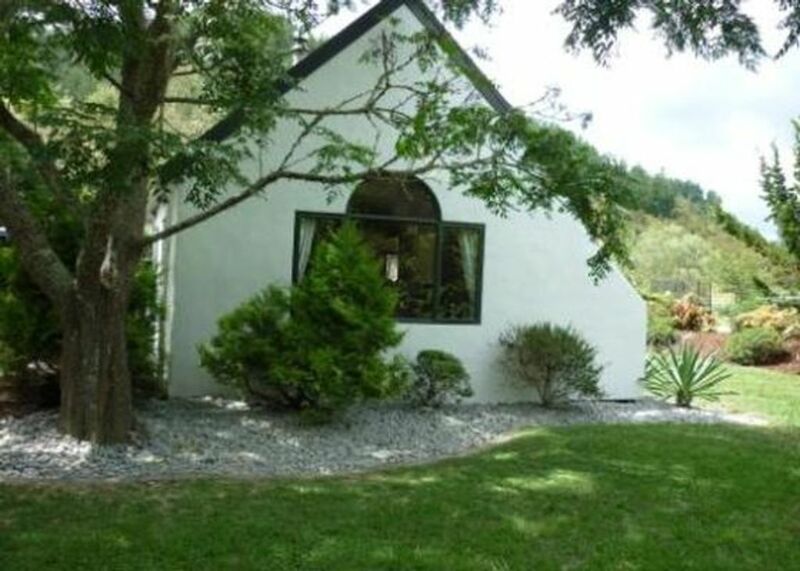 This lovely, secluded, renovated large two bedroom house is located in Coroglen beautiful Kapowai Valley on the Coromandel Peninsula, half-way between Whitianga and Hot Water Beach, close to Coroglen, Hahei, and only an hours’ drive to Coromandel Town. You will be ideally located for exploring the wonders of the Coromandel Peninsula. Dragonfly Valley house is situated on "Dragonfly Farm", a small lifestyle farm, and is surrounded by the tranquil environment of native bush and farmland. The house has a private BBQ deck and garden area as well as the 3 acre garden area. It is only a couple of minutes walk away from the Kapowai River and swimming water hole. The play area includes swings and trampoline for the kids. The house offers maximum occupancy for 6. Two double bedroom with a full kitchen and dining area, including fridge freezer, full oven and microwave. The lounge has two comfortable sofas and sofabed including TV with freeview channels, DVD and DVDs and a large library. Our private river swimming hole is only a few minutes walk away. Perfect for cooling down at the end of the day. We also have two kayaks for free use on the river, or at the beach for a small hire charge. With the world famous Hot Water Beach, where you can dig your own hot pool in the sand and enjoy the therapeutic waters only 12 mins drive away. Hahei and Whitinaga only 15 mins by car. Hahei's beautiful cathedral cove and shopping, restaurants and beautiful Buffalo beach in Whitianga, you will be full equipped for an amazing holiday. 10% DISCOUNT DEAL - Travel-cot available for babies up to 24mnths. Single night booking prices are for max 4 people - additional adults $15 and children $10 per night. This is to cover extra laundry costs. Mountain bikes and Sea Kayak avaiable for use at swimming water hole. Also can be used off site for a small daily hire rate. Roof rack required for Kayaks. A great place to stay. Clean, well equipped and plenty of room. The kids loved seeing the animals and will miss the donkeys. Lovely convenient location, excellent accommodation. Lovely convenient location, excellent accommodation. Limited mobile signal but otherwise ideal. Beautiful cottage, cuddled into a spectacular slice of NZ. Beautiful cottage, cuddled into a spectacular slice of NZ. Kids had a blast with the animals and running around the farm, close to amazing beaches and restaurants, we will be back! If you're looking for a secluded getaway, then this is the perfect place! We loved the location of Dragonfly - we easily did day outings to Cathedral Cove, Hot Water beach, Whitianga, Whangapoua and New Chums beach. The cottage itself was a perfect little spot to come home to each night and cook out.